The Honor 8 Pro utilizes the same Kirin 960 chip found inside the P10 and Mate 9 series. It is developed in-house by Huawei's chipmaker HiSilicon and has been around for some time now, originally making its debut on the Huawei Mate 9. Even with a few months of history behind it, the Kirin 960 is still one of the most powerful smartphone chips and we are glad to welcome it in our testing lab once again. The main processor within the chipset consists of a quad-core Cortex-A73 cluster clocked at 2.4GHz, plus a quad-core array of the familiar Cortex-A53 cores, ticking at 1.8GHz. The Cortex-A73s boast a 30% power efficiency compared to the previous A72 design, while delivering improved performance at the same time. We kick off the benchmark routine with some CPU-only loads in GeekBench. If you expected the new Exynos and Snapdragon chips to shake the charts, you'd be wrong. Apparently, the Honor 8 Pro's single A73 core performance is on par with the new S8 series and better than any other processor we've tested so far under Android, but Apple's Hurricane cores still trump everything else. But it's the multi-core tests where the four A73 units really shine and easily beat everything we've tested so far except for the new Exynos 8895 and Snapdragon 835 found in the Galaxy S8 lineup. The Kirin 960 choice of graphics, the Mali-G71MP8, is an enormous improvement over the previous generations of HiSilicon chips and is flagship worthy. It managed to perform beautifully on the regular P10 and Mate 9. However, on the Honor 8 Pro, just like on the P10 Plus and the Mate 9 Pro, it is tasked with pushing pixels on a QHD panel. That explains the major performance delta between it and the P10 in on-screen rendering. This offscreen test can give you a better understanding of the Mali G71MP8's real power. Unfortunately, the GPU came last among the flagship crop, though still a worthy contender. Still, while looking at the synthetics, bear in mind that most games will scale back gracefully in both resolution and detail, if necessary. Real-life gaming is definitely a pleasant experience on the Honor 8 Pro. Moving on to some all-round performance benchmarks, we find that the Honor 8 Pro shines bright in BaseMark OS II tests. It pretty much outpaces all other Android devices currently in our database, while comes on par with the P10 lineup. AnTuTu appears to show a different story. However, it's nothing really unexpected, since Huawei handsets typically get penalized in this particular benchmark for some reason. That being said, the Honor 8 Pro falls in line perfectly with its expected performance. The Honor 8 Pro stands tall in the performance race - nothing short of a proper flagship offer. We really couldn't ask for anything more in the CPU department. As for the GPU, frankly, the Mali-G71MP8 happily chewed through any graphics task we threw at it even though it is not topping the charts. 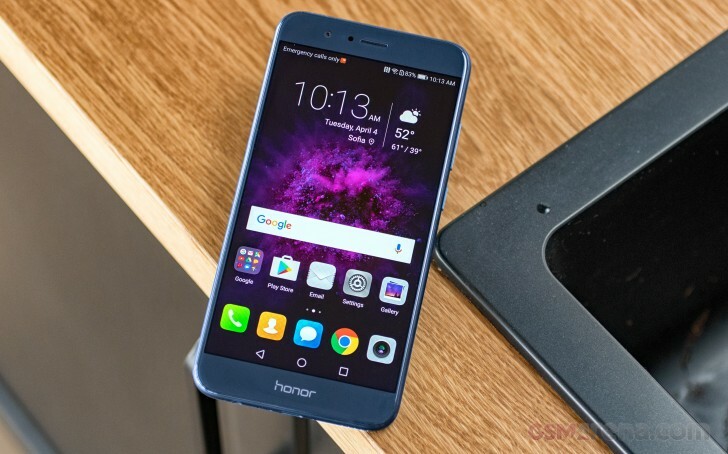 Under heavy synthetic loads, the Honor 8 Pro gets hot at one particular (small) spot at the back and if your finger happens to rest there, the phone may not be comfortable to hold. But it's far from dangerous and even Huawei thought so, as it seemingly did not implement any performance throttling to combat the rising chip temperatures.